Who doesn't dream of being royal on occasion? The fancy chauffeured car, the adoring fans, a designer wardrobe, the power and prestige, never having to do laundry again, the vault stuffed to the gills with priceless gems? When we played "queen for a day" as children we didn't understand the responsibilities that come with being royal and were far more concerned with the bling and trappings. As an adult, I wouldn't want a public life and have my family be under constant scrutiny on a global scale, but who doesn't think they'd look a little better if they were wearing a tiara while washing the car or grocery shopping? I was given a tiara for my 18th birthday by a friend and I'd reach for it now and again when powering through a difficult paper, college essays, or a task I needed to slog my way through. I had that tiara for years and it's amazing how a crown can improve your mood! I'd like to introduce the Queen For A Day Cowl, a Fair Isle cowl knit in the round from the bottom up, inspired by all of us who need a little bling in our lives. Knitted bling? Whoever heard of such a thing? This is the perfect way to not only have your crown, but to embrace your inner queen and rule your day like the benevolent leader you are! Worked in two colors of Queen City Yarns Wesley Heights hand dyed superwash worsted, the tonal solid plays off the speckled yarn nicely, creating depth and charm. Knitting up on US 5 and US 7 circular needles, the bands of royal crowns flank a bold, geometric pattern. It'd be simple to add or remove repeats in the midsection if you want a longer or shorter cowl, or add additional bands of crowns. Topped off with easy garter edging, this is my new favorite design - there's something cheeky and whimsical about it that I love! Download the Queen For A Day Cowl here. You know I love bringing you fiber and crafty-related articles, dear readers. I came across this one recently and it gives "blending into your environment" a whole new meaning! My favorite is the man knitting and blending into his seat cushion at the end. Spectacular! Original article found here. No matter where you find yourself on the globe, the Olympic Games are magical. People from everywhere and anywhere come together, celebrate hard work, sportsmanship, true dedication, and patriotism. We root for our countrymen, the underdogs, the singular brave representative from a country, and for a moment forget about the bad things happening in the world and focus on the Games and unification. Personally, I enjoy the summer and winter games equally, but with this bone-chilling cold snap we find ourselves in this winter, I'm looking forward to hunkering down under a blanket with my family, and cheering the winter athletes on as they skate, ski, ride, and slide their way to victory. While I look forward to the Olympics every 2 years with excitement, I anticipate casting on for my Knitting Olympics project and think about it very carefully months in advance. Due to some controversy a few years back, we're not technically supposed to call it the Knitting Olympics, so Ravelympics, Winter Games Knitting - whatever tickles your fancy - is upon us. What is the Knitting Olympics, you ask? This is a time to choose a project that you feel might be a smidge over your skill level, a project that you know will take some time (we're not talking about a garter scarf), or a technique you've been itching to try. We cast on when the Olympic cauldron is lit at the official start of the Games on February 9th, and bind off by the time the cauldron is extinguished on February 25th, at the official ending of the Games. It should be challenging, perhaps even something you're a bit nervous about casting on for, and the perfect companion as you watch the events. There are dozens of forums on Ravelry to join, with some that award virtual medals, some focusing on a certain technique, or some where all are working on the same project. In honor of the Games taking place in Pyeongchang, South Korea this year, I've teamed up with Hazel Knits - an American company featured way back in my first book Knit Local: Celebrating America's Homegrown Yarns, to bring you a free pattern perfect for your Winter Games knitting. A Fair Isle cowl worked in the round from the bottom up with corrugated ribbing edges, whimsical sheep motifs as a nod to early American shepherds, traditional stranded colorwork motifs, striping, and an apropos palette, this cowl was designed for both those comfortable with Fair Isle knitting and those ready to take the leap and try it out for the first time. Knitting up on US 6 circular needles, this cowl has a 24" circumference and a 12" height, making it my favorite size for a cowl that is not only beautiful, but will keep you warm in these chilly months. I love Hazel Knits yarn and their washable worsted weight Cadence has perfect stitch definition for this kind of knitting. I've decided to release this design a bit early so you can order your Hazel Knits Cadence (100% superwash merino wool) in Poppy, Nekkid, and Jay Blue, and have time to take my Craftsy Fair Isle Fundamentals class beforehand if you need a comprehensive course in getting started with proper techniques. Hazel Knits has kits available for the cowl here at a special price until January 16th and you'll have them before the Games start. 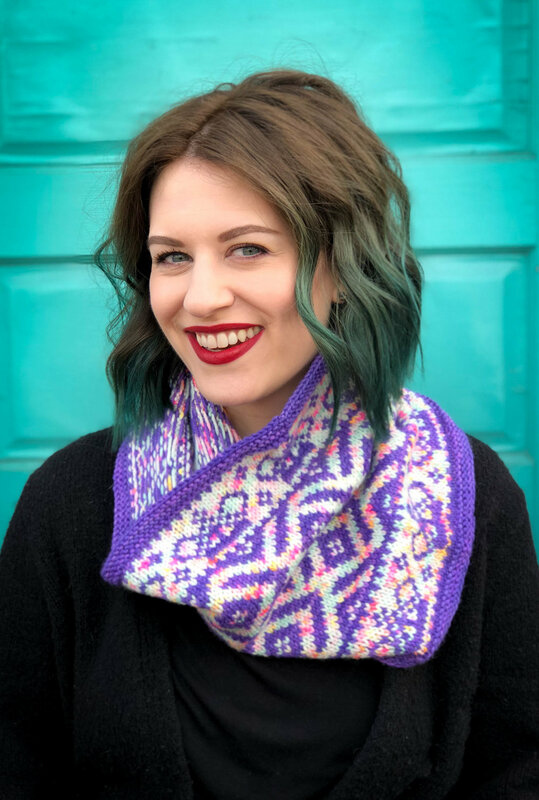 Once you've got your confidence boosted in stranded colorwork knitting, you can wind your yarn, print your pattern, grab your snacks, watch the Opening Ceremonies, and cast on! I look forward to cheering on Team USA with my fellow knitters and hope you enjoy knitting this patriotic cowl. I'd love to see your cowls on Instagram, so be sure to tag me at @tanisknits so I can see your progress. GO USA! GO WORLD! Download the free Winter Games 2018 Cowl here. Tapestries are a great source of inspiration for me. I look at them and marvel how so many have stood the test of time, many of them looking like they were taken off the loom yesterday. The vibrant colors, the intricate scenes they depict, the sheer scale, and the amount of time they must have taken to create make them a unique medium. Our friends at Wikipedia tell us, "Tapestry is a form of textile art, traditionally woven on a vertical loom. Tapestry is weft-faced weaving, in which all the warp threads are hidden in the completed work, unlike cloth-weaving where both the warp and the weft threads may be visible. In tapestry weaving, weft yarns are typically discontinuous; the artisan interlaces each coloured weft back and forth in its own small pattern area. It is a plain weft-faced weave having weft threads of different colours worked over portions of the warp to form the design." As a kid, my mom and dad brought me home a coloring book with details from the Lady and the Unicorn tapestries from one of their travels. I loved that coloring book and it took me years to color it all in because it was special to me. This was before coloring books were trendy, so I suppose I was ahead of my time! That coloring book ignited my love of tapestries and unicorns. I met Aimee from Little Fox Yarn this past autumn at the Shenandoah Fiber Festival. We look forward to the festival each year (especially the apple cobbler) and have attended for years. Her colors shone and I was drawn to her booth immediately. With a true eye for color and training as an interior decorator, everything in her booth was lovely and could easily be mixed and matched. It was almost impossible to choose just a few colors, but I left her booth with yarn in my hands and a smile on my face. I had Fair Isle plans. Inspired by old tapestries, I'd like to introduce the Tapetis Cowl, a Fair Isle cowl that uses just 3 hanks of Little Fox's Vulpine DK, a delightful blend of merino, nylon, and cashmere. This luxury cowl is a great combination of corrugated ribbing sandwiching a fun-to-knit Fair Isle pattern working up on US 7 circular needles. The 3 colors are used in equal amounts, using almost the entire skein, but it'd be super simple to add or take away length depending on what you like. This yarn was amazing to knit with, I loved the colors, and couldn't wait to get it around my neck! 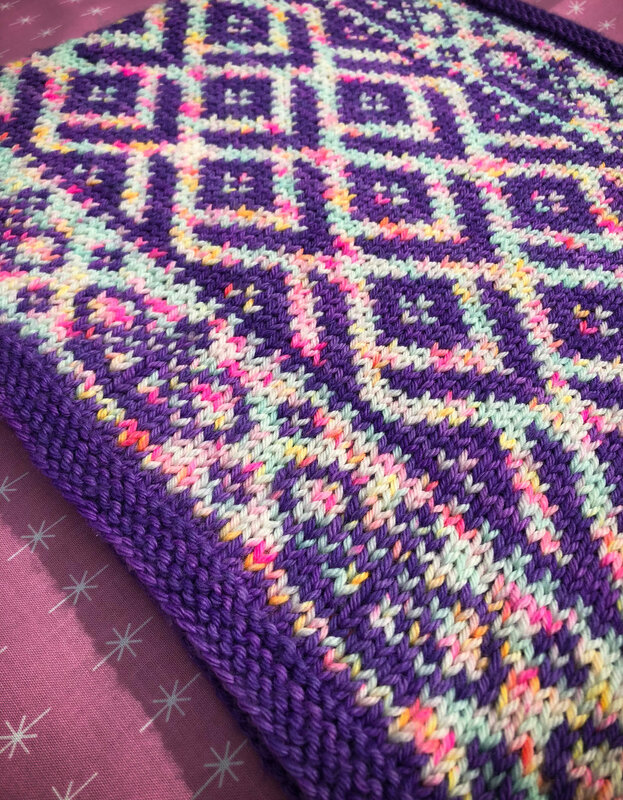 I love a cozy color work cowl! With so many gorgeous combinations to chose from, Little Fox Yarn has come up with 3 alternate combos in addition to the original as a kit for the Tapetis Cowl! I love the idea of giving this kit to a fellow knitter for the holidays, since so often we knit and knit for everyone else and forget about ourselves. This is another cowl that has gone into my daily rotation and I find myself snuggling into it throughout the day. Download the Tapetis Cowl pattern here and check out the stunning kits from Little Fox here.